I could easily go up to the seventh floor here at NEHGS and find a lot of my ancestry in published genealogies, but my research interests have gone in a different direction: I have spent close to the last six years researching the branches of my Italian family in Windsor Locks, Connecticut, and writing a genealogy that traces all of the descendants of the earliest generation. 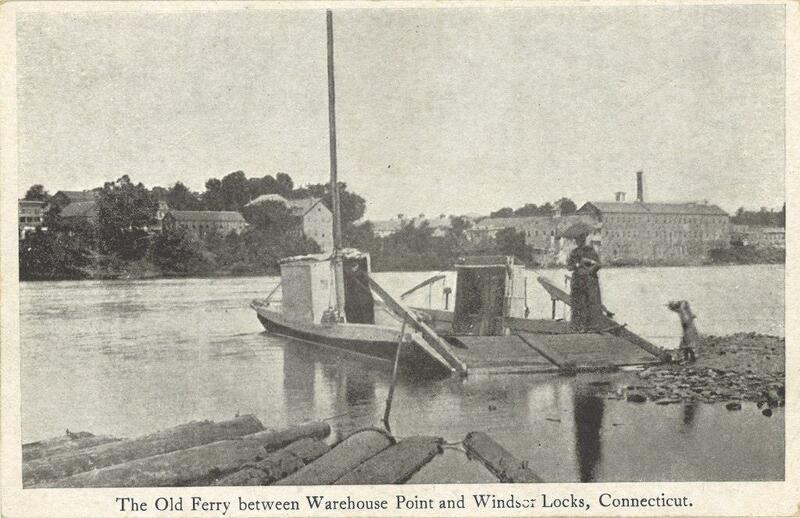 Windsor Locks was a mill town, and some early family members worked in the mills that lined the banks of the canal. They weren’t the wealthiest people, but some of them owned their own homes and other property. As I began writing, I found that I wanted to provide information on their lives beyond stating facts from a census and other official records. I began to wonder how to focus on the individuals, providing context for their lives without being overly repetitive. From census records I can say that they were mill workers, but in the early 1900s what did that mean for people living in Windsor Locks? 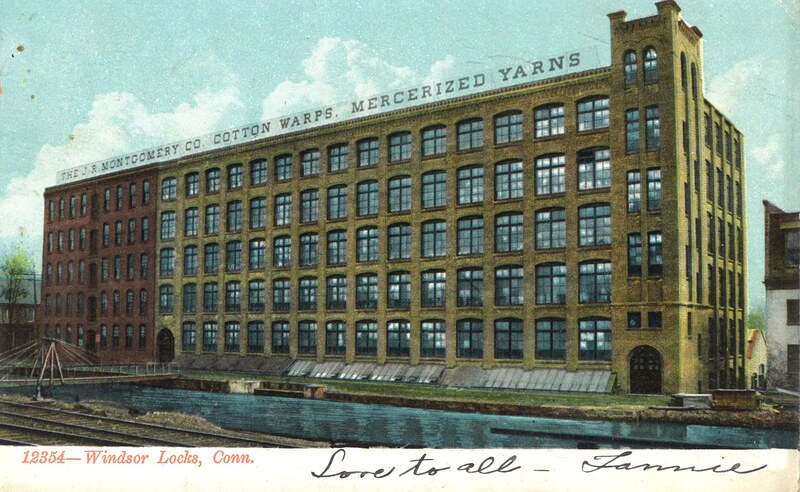 I realized the solution to my problem was to include a brief history of the Windsor Locks mills along with my genealogy. For example, Connecticut published a report that provides the names of some of the mills in Windsor Locks, what they produced, and describing the general condition of the state’s mills. The report even says that there was one mill in Windsor Locks that provided work to people that could be performed at home – and it gives descriptions of that mill work. From a newspaper article, I know that in 1903 the J. R. Montgomery Co. fired thirty workers because the president and general manager thought the union was making unreasonable demands; a union leader replied that the group had as yet made no demands of the company. I may not be able to determine if any of my family members did work at home or were part of the group that was fired, but I can provide information like that in the history to suggest the issues they faced in their professional lives. By stepping back from focusing on the individuals and their families, and showing what life was like for them in their community, I am able to provide more than just simple facts about my family. 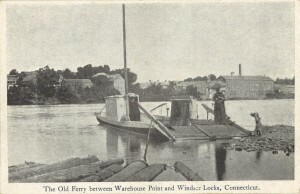 Right now I am still gathering information on both my family and the town, but I can already see the potential for this project to provide greater context than I have seen in other, similar histories of Windsor Locks. That type of research is the best! Our families were a part of the times and places in which they lived. To know about those makes our ancestors more real and to put our ancestors into a place or time makes history come alive too. What I have found in the newspapers, deeds, wills, suits filed and defended, and personal collections of letters and photos gives me too much information! I am loving it but do not really know what to do with it. Jason, I found the need to do the same with my paternal TILLINGHAST line back to 1537. Although it has taken me over 15 years and 344 pages to gather “context”, it has been well worth the “voyage” back in time. When I read my work it feels as if I am “there” with them all; from Essex, England through Rhode Island to Ohio, ministers, coopers, soldiers, entrepreneurs. This is why I always refer to my work as family history, not genealogy. Jason, it is terrific that you are fleshing out the details. As a veteran secondary social studies teacher, I always emphasized that history was more than just famous people and names and dates. Now I am following your example in researching my three times great-grandparents and their descendants. Both families immigrated from Germany before it’s unification and moved to the same area of Massachusetts. I have been finding great details in researching their property transactions in addition to more traditional genealogical records. Thank you to whatever bright mind had all Massachusetts digitize the property records for all counties and make them available online! Your post came this morning after I had been working on my paternal Twomey family last night. In the early 1900’s most of the men were employees in the shoe industry; first in Illinois and Missouri. An early 1900’s city directory from Dixon, Illinois indicated employment at W-P-S (Watson Plummer Shoe Company), makers of Red School House Shoes. Being a librarian I had to pursue this and I was able to identify the entire name of the company plus finding a picture postcard on EBay (for $20). I also have documentation that my paternal great grandfather worked for Buster Brown shoes in St. Louis. There does seem to also be a connection between Buster Brown Shoes and Dixon, Ill. My maternal line, from North Bridgewater (Brighton), Massachusetts were also shoe company employees. Inspired by your comments I think that I will write a “family history” that will also focus on the shoe factory towns and shoe industry . Thanks for your post. And it is very cool that you can still see parts of the canal on certain departures/landings to & from Bradley Field! Jason, what a wonderful piece. The connection between history and genealogy is undeniable. It is wonderful to see a genealogist with a larger scope to see their family history! Best of luck with your historical adventures! This is exactly my goal. I may not be able to fill in all the personal details but over time I hope to be able to create a picture of my ancestors’ lives. I have learned so much about America by thoroughly embracing your approach to genealogy – uh, family history. I wish every secondary school student could do a family history project. They could experience America instead of just memorizing it. I want to say “Ditto” to you Ann for the comment about 2ndry schools doing a family history project. Myself, I have learned so so much about myself, my community, and the world through my years of research on the 12 generations of my family. What a brilliant experience it would be. Excellent and exciting. My mother did her family in an organized way but still some loose ends and this will help greatly as I prepare to donate to NEGHN.